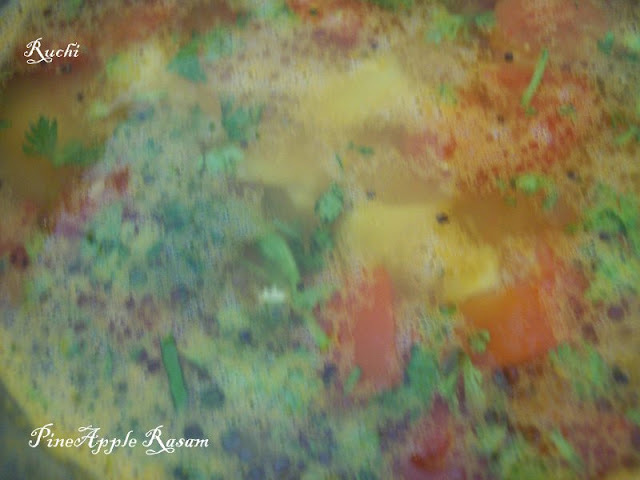 Pineapple rasam is a variation to traditional tomato rasam. This pineapple rasam is a sweet and sour combination mixed with ripe pineapple pieces, rasam powder, and pineapple puree and toor dal. and It gives totally a different flavor and taste.I like this rasam verymuch. 1.Cut the tomatoes & pineapples and keep aside. 2.Grind the coriander seeds, pepper, jeera , red chilly coarsely and keep aside. 3.Take a deep kadai and boil 2 cups of water along with the pineapple cubes, rasam powder, salt, turmeric. 4.Meanwhile pressure cook toor dal and puree the dal. 5.After the pineapple cubes are partially cooked, add chopped tomato and let them cook too. 6.Then add the pureed pineapple and cooked dal to the simmering rasam. 7.In a small heated pan, add ghee, mustard seeds, jeera, curry leaves few and asafoetida. 8.Transfer this seasoning to the rasam, and add chopped coriander leaves and cover with a lid and remove from flame. 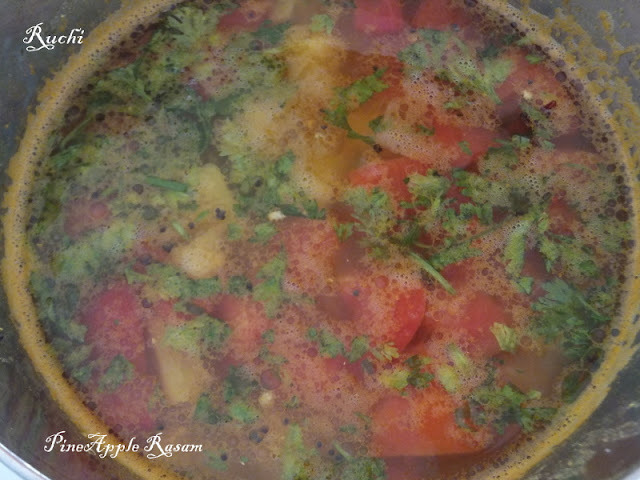 9.Quick, tasty sweet , sour &spicy rasam is ready! Its been ages i prepared this flavourful rasam.